European Commissioner Dr Tibor Navracsics presenting Valletta 2018 Chairman Jason Micallef with the commemorative plaque marking the occasion. Valletta is officially inaugurated European Capital of Culture in a ceremony held at the Mediterranean Conference Centre this evening. The ceremony marks a historic moment not only for Valletta itself, but for all of Malta. Tibor Navracsics, European Commissioner for Education, Culture, Youth and Sport was present at the ceremony, and spoke about the unique opportunity the European Capital of Culture title and the European Year of Cultural Heritage bring in terms of safeguarding and promoting Europe’s cultural diversity, highlighting our common values and underlining how culture contributes to Europe’s society and its economy. 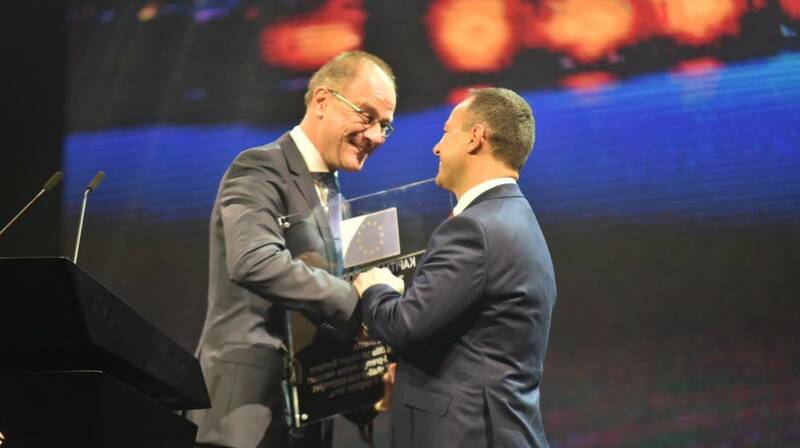 After his speech, Dr Navracsics officially handed the European Capital of Culture title to Valletta 2018 Foundation Chairman Jason Micallef, presenting him with a commemorative plaque to mark the occasion. The plaque also commemorates Valletta 2018’s award of the Melina Mercouri Prize, a grant awarded in recognition of the work carried out by the Foundation to highlight Valletta’s rich cultural diversity. Jason Micallef expressed his delight and excitement at witnessing the inception of the celebration of the people’s festa. The ceremony was attended by Valletta Mayor Alexiei Dingli, who spoke about Valletta’s journey towards this historic moment. Valletta 2018 Foundation Chairman Jason Micallef spoke of Valletta 2018’s 365-day Cultural Programme, aimed at stirring hearts and minds, and which Malta has never seen the likes of. Also present was Dr Deo Debattista, Parliamentary Secretary for Consumer Protection and Valletta 2018, who emphasized we are bearing witness to an economic, social and urban regeneration which we have never witnessed before. Minister for Justice, Cultural and Local Government Dr Owen Bonnici noted that Valletta 2018 is a success story, and mentioned that culture is increasingly becoming a central point in our lives. Prime Minister Dr Joseph Muscat pointed out how the European Capital of Culture year is an opportunity for Malta to show off our heritage on a European and global level. The ceremony was concluded by a speech by the President of Malta, Her Excellency Marie Louise Coleiro Preca, who encouraged all the citizens of Malta to feel a sense of ownership and pride during this very special year. Five different performances by the Armed Forces of Malta Band also featured throughout the ceremony.